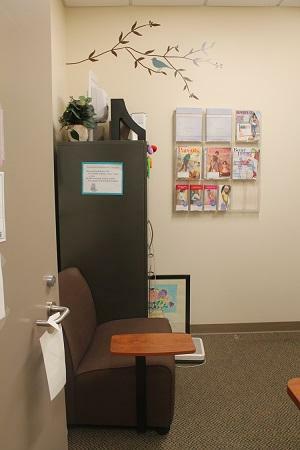 The Center for Student Wellness & Health Promotion is proud to offer a lactation station for the campus community. This is a quiet, comfortable, secure room where moms can breastfeed or pump for their child. Refrigeration for pumped milk is also available. A diaper changing station is located adjacent to the space. In addition, we have informational resources on pregnancy and breastfeeding. The Lactation Station is open Monday through Friday, 8 am - 5pm, with the exception of Tuesdays and Wednesdays from 2 - 4 pm during weeks 4, 5, 6, and 9.